Output valve Selection and matching Burn in Process –The Watford valves way. The valves characteristics change quite dramatically during the first hours of use. It is also in these early stages that 95% of output valve failure occurs. There are many reasons for this such as too much residual gas from inside the envelope left from imperfect manufacturing vacuum, Instability due to non existent factory ageing or impurities in the coating of the valves anode plates which can cause red plating. These are just some of the common faults that we have found. At this point it is clear to anyone that uses valve amplifiers that they need to have been put through a thorough selection process first. The most important process is the burn process as it is by this process that most valve problems can be detected. Many valve suppliers use low voltage burn in rigs and claim long burn in times. Whilst this system is better than none at all, it really is an inadequate way to check what a valve will actually do when it is installed in your amplifier. At Watford valves power output valves are first mounted in our own custom designed burn in rigs. 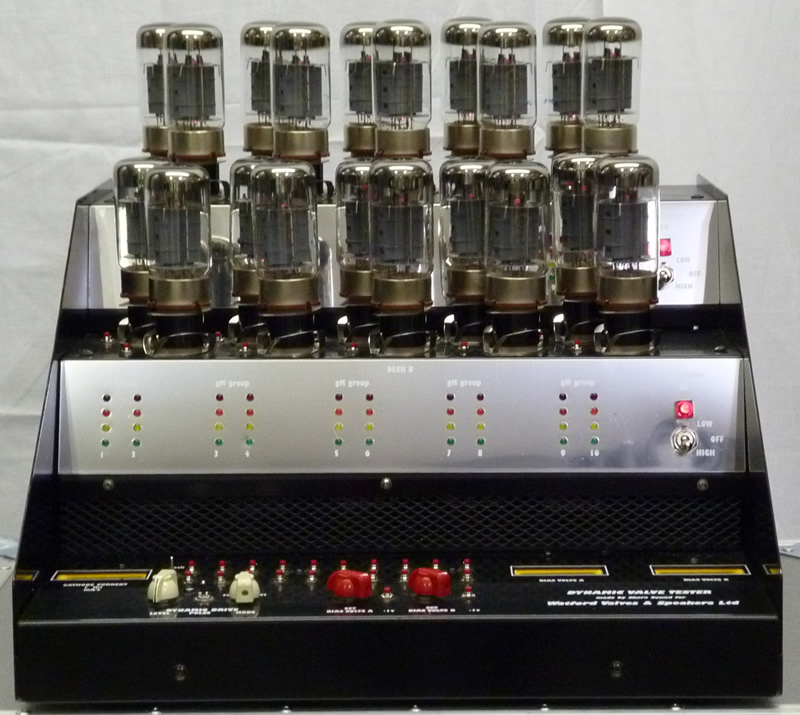 These rigs run the valves in real working conditions in real working amplifiers so the valve will experience exactly what it will meet when installed in your amplifier. These rigs run the valves both statically and dynamically to ensure that all valves undergo exacting quality control measures. It is at this stage also we subject our own Harma Brand to the additional Drive Testing /Burst testing régime. Here the valve undergoes a series of timed and controlled bursts. The stress that the valve is put through is exactly the same as it will encounter in your amplifier when you hit a hard power chord or drive you amplifier hard. By running valves in working conditions we can correctly age and stabilize the valves to prevent drift on both current draw and gm, this is vital for close matching and critical for great tone. We can eliminate valves which will red plate with correct bias, plate and screen voltages applied, this is something that low voltage burn in will not identify. This process we do both dynamically and statically to further assure reliability. Guitarist magazine stated “Watford valves, with the aid of its custom built test rigs, puts the valves under real working conditions which is equivalent of a hellish week with the US navy seals." Only after a valve successfully passes these exacting tests it is then matched on Anode current (mA) and Transconductance/gain (gm) and placed into stock and offered for sale. Manufactures whose product have a consistently high reject rate or provide inconsistence batches with valves not meeting these criteria are rejected and items from these manufactures are not stocked. We offer free matching on standard output valve types such as 5881, 6550, 7027A, 7591A, 6L6GC, 6V6GT, EL34, EL84, KT66, KT77 & KT88 only or unless stated in our valve description. All other output valves can be matched so please enquire as a quotation can be provided for you particular valve type. Standard matching is done after the burn in process via our digital valve test rig with all valves being dual matched on anode current (plate current) and g/M (Transconductance) in real working conditions. Many companies simply match on anode current. This will not result in a good match as it is not an indication of the valves ability to amplify the signal. The tranconductance or gain as some times referred to is the measure of when a valve will clip. So we believe that both measurements are vital to ensure optimum performance or selection. This also enables us to supply valves of the same brand with different characteristics to suit your requirements. Our rig is one of the most accurate available today as it can match valves to 1 % accuracy on both parameters. All matching and testing is done with fully regulated supply voltage at 240v. All valves are selected in real working conditions and selected to provide the strongest, most reliable valves for today's professional music hire and touring musicians. Drive testing/burst testing and additional testing on Harma output valves. The valves are then matched on anode current (plate current) and g/M (Transconductance) in real working conditions. Drive testing is standard on all Harma octal output valves and EL84. The only exception to this is the Harma E84L where currently we do offer both a Drive tested and a non drive tested version. If you require valves tested this way then please contact us for a quotation.